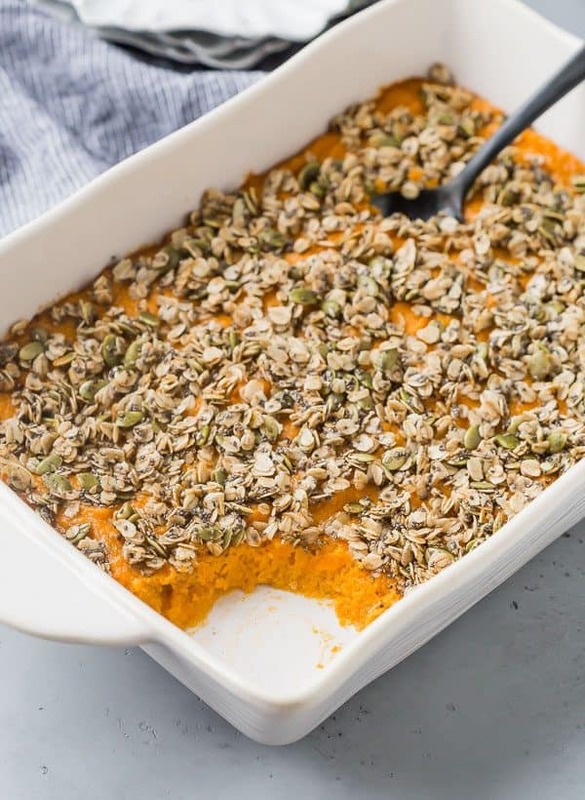 This healthy sweet potato casserole is gluten-free, allergy friendly, and so, so delicious! Perfect for Thanksgiving or Friendsgiving! It seems like there is a heated debate surrounding sweet potato casserole. Are you team marshmallow or do you want nothing to do with the soft pillows of sweetness? I’m no stranger to pairing marshmallows and sweet potatoes, like in this sweet potato bread pudding that’s piled with marshmallows. 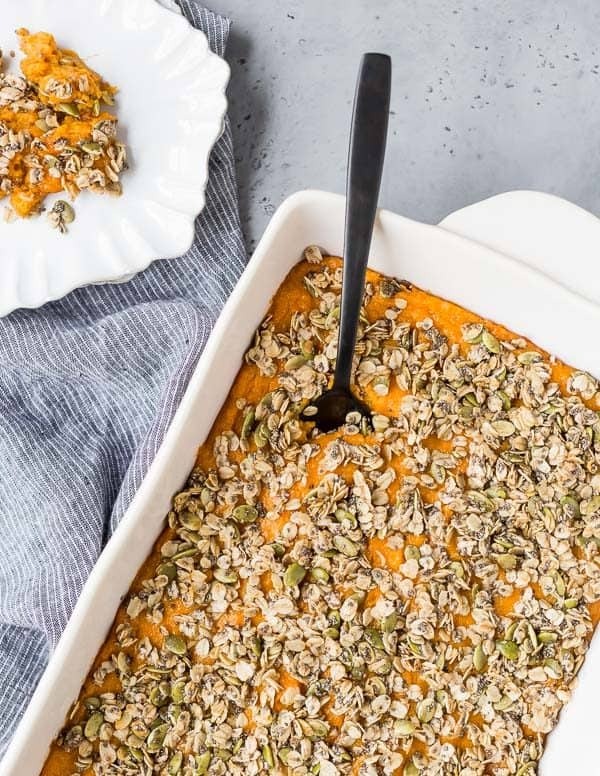 Or these fun hand-held numbers – kids think this hand-held sweet potato casserole is the greatest thing since sliced bread. 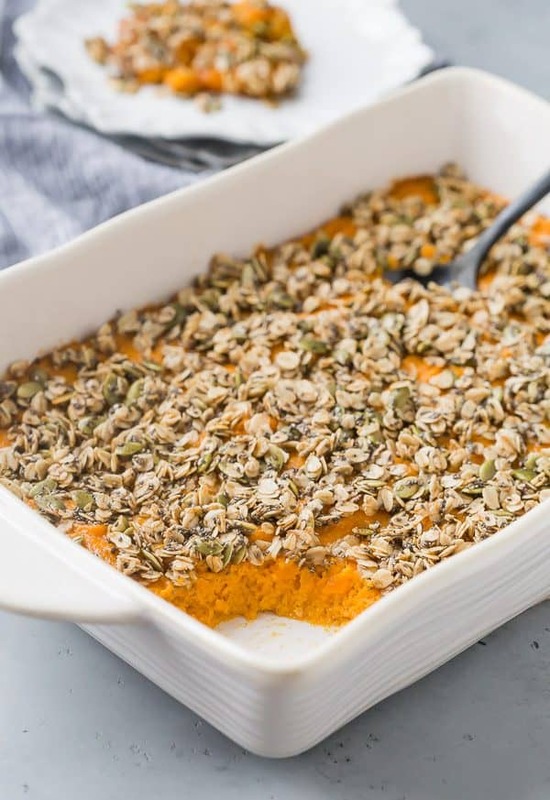 However, this healthy sweet potato casserole is a slightly different take on the classic dish. 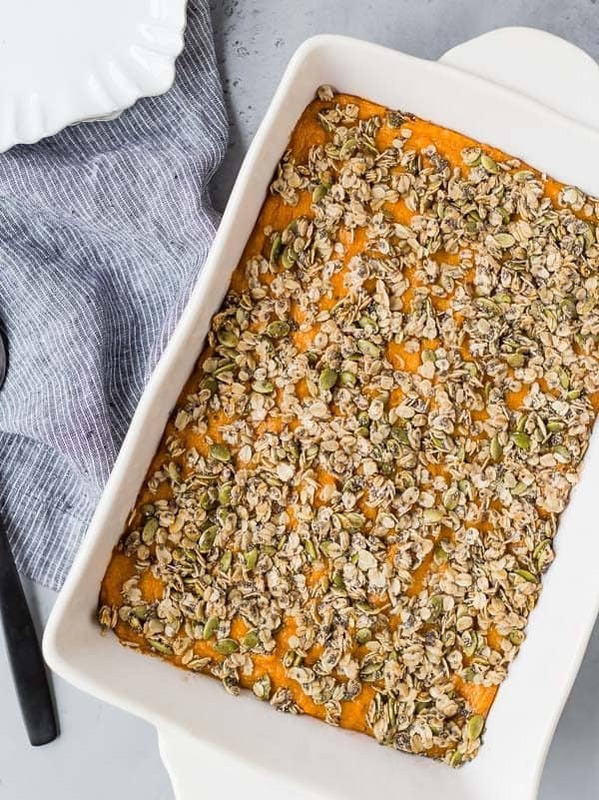 I’ve found that many healthy sweet potato casserole recipes involve pecans (can’t say I blame them, YUM), but I wanted to create one that my kids and everyone in my family could enjoy, not to mention all the other people out there with nut allergies. This recipe is also gluten-free and dairy-free (optionally), making it great for crowds that may include a few different special diets. However, albeit it free of nuts, gluten and dairy, it’s not free of flavor. 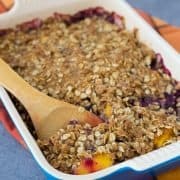 Ben’s exact words were, “I was skeptical at first but it’s so good!” I caught him sneaking a bowl as a late night snack more than once when I tested this recipe. (Despite the use of the words “caught” and “sneaking,” this behavior was wholeheartedly encouraged. The filling is rich and nearly custard-like. Sweetened with maple syrup, smooth, delicious…everything you want from sweet potato casserole. I used cow’s milk, but read on for adaptations to fit special diets. Instead of nuts or marshmallows on the top, I made a light topping of oats, chia seeds and pumpkin seeds. It’s pretty, crunchy, and flavorful. To make nut-free: Use cow’s milk or coconut milk. To make dairy-free: Use almond milk or coconut milk. To make nut-free and dairy-free: Use coconut milk. If you don’t need to make it nut free: Try adding pecans to the topping. Don’t want to use maple syrup: I get it, it’s pricey! Use brown sugar, or even better, dark brown sugar. Coconut sugar would also work well in this recipe. Allergic to coconut? No worries, you can eat this too! Use butter or ghee instead of coconut oil. One day before you want to serve this, prep the sweet potato mixture and spread it in the pan, keep it covered in the fridge. Also, mix the dry ingredients of the topping together in a bowl. Cover that and leave it on your counter. On Thanksgiving day, all that’s left to do is add the maple syrup and coconut oil to the topping, stir it together, sprinkle it on top, and bake. So easy! IMPORTANT: Make sure to let your glass pan come to room temperature before putting it in the hot oven! The abrupt temperature change could crack your dish. 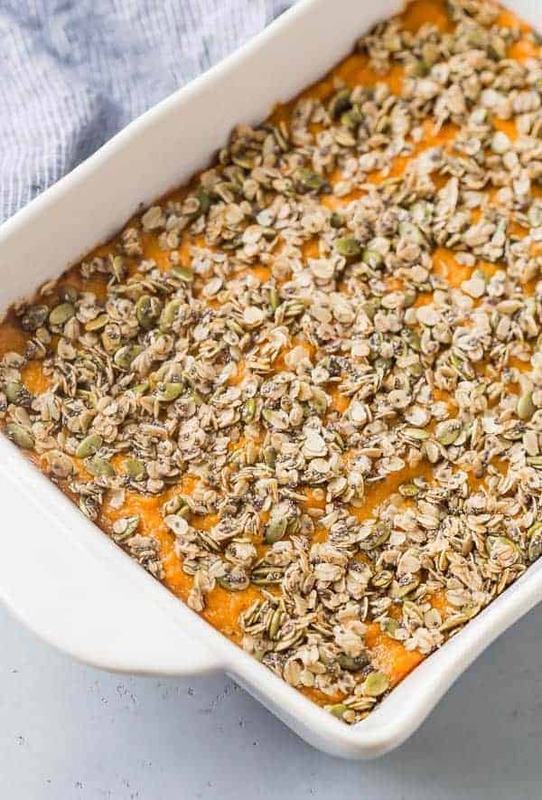 Can’t get enough sweet potatoes? Try these vanilla bean mashed sweet potatoes, scalloped sweet potatoes (with bacon and gruyere!) 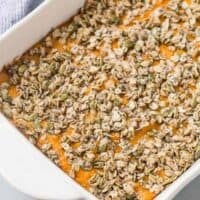 or this classic sweet potato casserole. Preheat oven to 350°F. Butter or spray 9x13 pan (I like to use coconut oil spray). In a large mixing bowl, use an electric mixer to beat together sweet potatoes, eggs, milk, maple syrup, vanilla, salt, and cinnamon until smooth. Spread into an even layer in prepared pan. 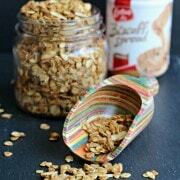 In a small mixing bowl, combine oats, pumpkin seeds, coconut oil, chia seeds, maple syrup, and cinnamon. Stir so that all dry ingredients are moistened. 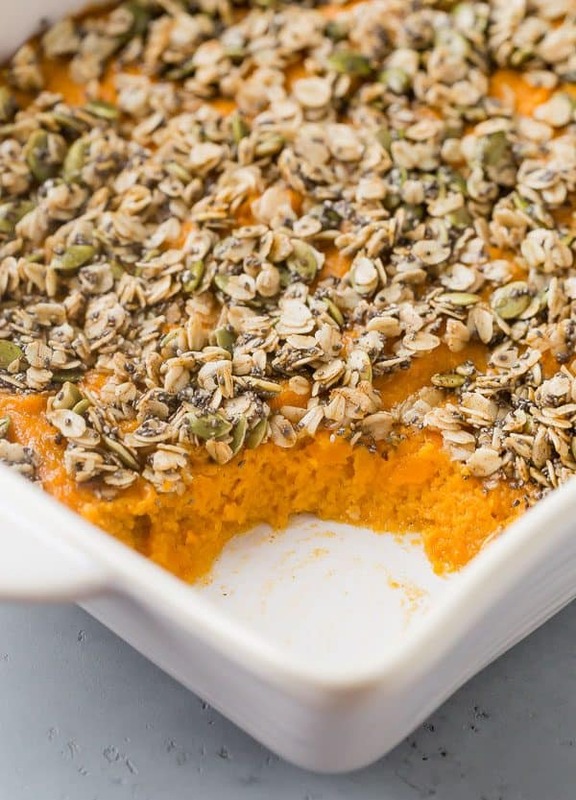 Sprinkle oat mixture on top of sweet potatoes evenly. Bake for 45-50 minutes or until topping is golden brown and sweet potatoes look set. To make nut-free: Use cow's milk or coconut milk. If you don't need to make it nut free: Try adding pecans to the topping. Don't want to use maple syrup: I get it, it's pricey! Use brown sugar, or even better, dark brown sugar. Coconut sugar would also work well in this recipe. Verdict: Loved this so much! It makes a good breakfast too….I mean…I would assume… (but really, it does). Husband’s take: Ben loved this SO much! I couldn’t believe how much he liked it. Changes I would make: None at all but make sure to check out the adaptations above to make it your own! This was so so good! My kids even liked it and it was healthy! I only have roasted pepitas with salt, can I use these in the topping? 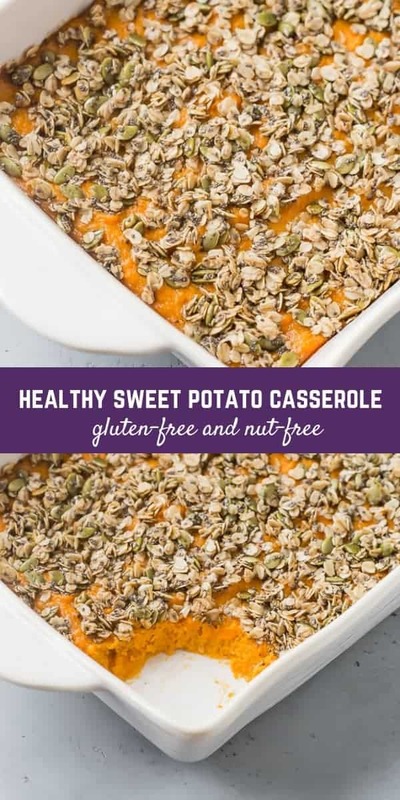 because I’m the only one eating sweet potatoes most of the time, we never do a sweet potato casserole–shocking, I know! Thanks so much . 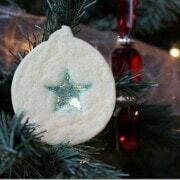 Do u have diabetes friendly recipes to share? I have lots of different recipes on my site – if you browse my recipe index, I bet you’ll find lots to love that will suit your diet!